Cinnamon leaf oil is native to Indonesia, but it is cultivated in India and Sri Lanka, too. The oil is extracted from the leaves of tall trees by steam distillation. The tree can grow to heights of 45-feet, but is usually kept at a much lower height. The tree bears small, green leaves, white flowers and little purple berries. 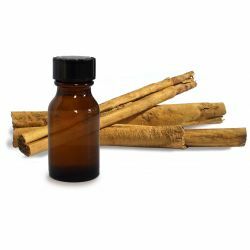 Cinnamon leaf oil is a brownish-yellow oil, which has a warm, rich and spicy aroma. This oil blends well with peppermint, candy, and can be used as a flavour. Commonly used to fight feelings of depression, weakness and exhaustion, it has many other properties, including being an antiseptic, antibiotic and analgesic. Currently, we buy our cinnamon leaf oil from Sri Lanka. In perfumery, cinnamon leaf oil is used for its spicy, woody notes, creating an uplifting scent to fight fatigue and mood. We’ve used it in our Blue Skies and Fluffy White Clouds Bubble Bar for its woody aroma. We use cinnamon leaf oil in New, a warming and nourishing solid shampoo bar, which stimulates your follicles and encourages healthy hair growth.